Anode Beetles (エレキムシ?, lit. : "Electric Bug") are small black beetles with four yellow spots on their wing casings. They are named 'anode' due to the fact that they produce electrical currents if another one is nearby. 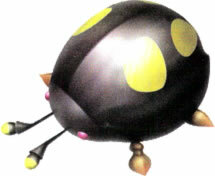 This creature is blissfully unaware of Pikmin, and if found alone, they are harmless; but if there is a partner nearby, they can produce an electrical barrier between them, making any nearby Pikmin subject to electrocution. As such, they are commonly found in groups of 2 or more. Swarming will not harm it, as it has a protective shell, similar to the Flint Beetles. To harm it, one must throw a Pikmin on top of it to flip it over, then proceed to swarm it. Purple Pikmin can cause them to flip over even if not directly hit. Anode Beetles are almost always found in groups. This is because in order to pose any threat as enemies, they must generate electricity between each other. This process takes a few seconds because the two creatures must first align themselves such that their rear ends are facing each other, and then the discharge procedure itself takes a few seconds. Once it appears, the electric arc between two beetles will kill any non-Yellow Pikmin it touches. If an Anode Beetle is all alone, or is unable to link with a partner, it will still occasionally produce small jolts of electricity from beneath its wings, but these are harmless. If two beetles are connected with an arc of electricity, and one of them gets flipped over or becomes petrified, the connection will disappear and the other beetle will resume idling. Anode Beetles are defensive creatures; they cannot be damaged will standing upright. They can, however, be flipped over is a Pikmin is thrown directly onto one's back, or if a Purple Pikmin is thrown such that the shock wave forces one to flip over. Once flipped, an Anode Beetle can be damaged with ease and can be defeated relatively quickly. Since this enemy can kill any type of Pikmin that is not immune to electricity, it is advised to use Yellows. Simply throw a Yellow Pikmin onto it, and proceed to swarm it with any Pikmin you have. A group of 20 or more Yellows can kill it in one cycle. Alternatively, you can use other Pikmin types, but with care, as electrocution is highly possible. As an upside, Purple Pikmin can flip the beetles even if not directly thrown on top of them. Bulbmin are also useful in caves such as the Submerged Castle. Note that, just like Flint Beetles, the Anode Beetle is not harmed by the rocks of Lithopods. It is not harmed by bomb-rocks, Gatling Groinks, or the Waterwraith, either. If the player hits an Anode Beetle on the same frame it would start rotating to face a partner, the Beetle will get up instantly. Distracted players could end up losing Pikmin to an enemy that would otherwise be disabled. An anode is the negative terminal of a voltaic battery. This word references the beetle's electrical nature. In Japan, it is known as エレキムシ?, which literally translates to "Electric Bug". Its scientific name is Scarabum electrodea, in which Scarabum refers to the real world scarabaeidae family, where scarab beetles are from, and electrodea is Latin for "electrode". Internally, it is called elecbug, a shortening of its Japanese name's translation. French Scarabée Electrique Electric Beetle "Electrique" should be "Électrique". An Anode Beetle's in-game appearence. An Anode Beetle beginning to discharge. Two Anode Beetles creating electricity in between each other. The creature's e-card, #21 (12th yellow card). This page was last edited on February 20, 2019, at 21:16.